Sometimes a program must be run with administrator rights in the system. This gives the program more privileges, which sometimes is necessary to make a program function as expected. In Visual Installer 2014 you can set an installed program to run with administrator privileges in an easy way. To make an installed program to run with administrator rights you can right-click on the program in Visual Installer’s file list and choose the Run as administrator menu item in the menu that is shown. 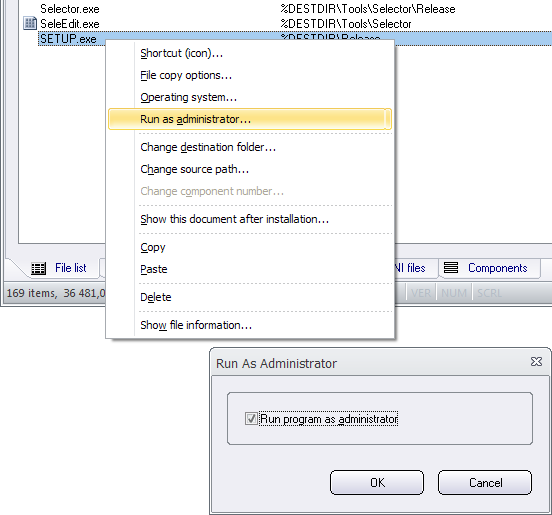 Thereafter you can select the Run program as administrator option in the dialog box that appears and press OK (see picture below).